Some observers in Seoul, deeply troubled by the outcome of the first Trump-Kim summit in Singapore, feared that the Hanoi Summit might produce an agreement that only partially addressed North Korea’s nuclear and missile threat and that the US would provide too much compensation to North Korea in return, especially in areas affecting ROK-US combined defense posture. 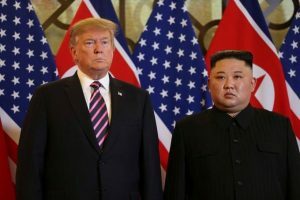 They went so far as to say that “No deal is better than a bad deal.” On the morning of February 28, I also had begun writing a column under the title: “Can we salvage the Hanoi debacle?” But the second Trump-Kim summit did not turn out the way many in Seoul had feared, and the “no deal” outcome was actually welcome by them. While not all the details have come out yet, the thrust of what happened in Hanoi is pretty clear, thanks to post-summit press conferences given by President Trump, Secretary of State Pompeo and senior US administration officials in the aftermath of the meeting. In addition, the North Koreans uncharacteristically gave several press conferences of their own. Surely, those North Korean briefings contained a fair amount of spin, but they were nonetheless helpful. In Hanoi, President Trump had the option of accepting a deal that exchanged the dismantlement of Yongbyon for providing some sanctions relief, while important details remained to be worked out. As it turned out, Trump not only rejected this small-scale agreement, but chose to “go bigger,” asking to broaden the scope of an agreement beyond the Yongbyon nuclear complex. Kim Jong Un was unprepared to consider this approach and ended up revealing that his idea of denuclearization was different from that of the international community. Trump’s proposal to accelerate the process and have sanctions removed more quickly makes eminent sense, but only if Kim Jong Un had made the decision to give up the country’s nuclear weapons. Had he been willing to denuclearize, Kim could have objected to the pace of Trump’s offer rather than rejecting the whole deal. This is a particularly critical point in Seoul where key officials insisted that Kim Jong Un had already made a decision to give up nuclear weapons. Whether or not it had been President Trump’s intention all along, his “go bigger” offer effectively forced Kim Jong Un out of his comfort zone. In this sense, no agreement doesn’t necessarily mean failure. On the contrary, the Hanoi Summit produced important results which can turn out to be the first step toward genuine denuclearization talks. First, according to reports, President Trump clearly defined the end state of negotiations by handing Kim Jong Un a paper “broadly defining” the US concept of denuclearization. No longer will North Korea be able to play the ambiguity game with impunity. Second, by refusing to accept Trump’s offer to “go bigger,” Kim Jong Un revealed that he has no intention of parting with his nuclear arsenal. Surely, North Korea will again try to dupe the US and the international community. But it will not be easy this time. Third, North Korea made the same mistake it did during the Banco Delta Asia (BDA) incident when the Macau-based bank, under US pressure, froze $25 million dollars deposited in North Korean accounts. In one of the conversations with US officials, Kim Kye Gwan, then the North Korean Vice Foreign Minister, said “finance is like blood in [the] human body,” arguing that BDA was causing great pain to his country. His intention was to stress the gravity and injustice of US measures, but the remark was effectively an admission that finance was a serious pressure point with North Korea. Once again, by making an all-out effort to gain sanctions relief, North Korea revealed its key weakness. In his book The Art of the Deal, Trump observed that if the other side knows you want the deal more, he will smell blood and you’re dead. Now that Trump knows that North Korea wants sanctions relief badly, his ensuing actions are more or less predictable. If the Hanoi Summit had produced an incomplete agreement, the opportunity for denuclearization could have been lost forever. Thus, a potential catastrophe was averted. The US will continue to profess its willingness for negotiations and will send a team to Pyongyang if North Korea agrees. However, the US will likely maintain the current position that Yongbyon alone is not enough for substantial sanctions relief. At every opportunity, Trump will say that as long as there are no tests of nuclear weapons and ballistic missiles and full sanctions remain in force, he has no reason to hurry into a third meeting with Kim Jong Un unless there is a chance of producing an outcome that will bring him thunderous applause. It seems that Kim Jong Un is shaken. The leader’s infallibility doctrine makes it extremely difficult for him to deal with failure. It is no surprise that it took Rodong Sinmun, the North Korean Workers’ Party’s official newspaper, more than a week to report—not on the front page but on page six—that there was no agreement in Hanoi. Vice Minister Choe’s remarks seem carefully calculated to warn the US that North Korea might resume tests while not closing the door for dialogue—in particular, the dialogue between Kim Jong Un and Trump. In other words, North Korea likely has yet to make a decision and still wants to explore whether there is room for compromise on the US side. While gauging the US response, Kim Jong Un may choose to stop the negotiation and resume testing right away, or take a more incremental approach. Looking at the big picture, Kim Jong Un fundamentally has three choices: provocation, muddling through, and, of course, genuine denuclearization. There are some immediate signs that suggest a reversion to provocation, such as the rebuilding of key facilities at Tongchang-ri (also called Sohae), its satellite launch facility, and Sanum-dong, an ICBM-related site. But it is not yet clear whether North Korea will stop at posturing or resume flight testing either a long-range missile or a space launch vehicle. Pyongyang’s provocations will jeopardize its dialogue with the US. In addition, North Korea is likely to face stricter sanctions as UNSC Resolution 2397, adopted in December 2017, commits the Security Council to further restricting petroleum exports in such occurrences. Since negotiations started last year, North Korea has not resorted to brinkmanship—at least not on its past grand scale. However, there were small cases. For instance, on November 16, 2018, North Korea attempted to provoke after six months of trying in vain to get sanctions relief. It announced that Kim Jong Un attended an unspecified “cutting-edge TACTICAL weapons test.” Lest this tactical weapons test should cause a strong US reaction, North Korea released the last detained American citizen the same day. Muddling through seems like the easier option for Kim Jong Un—at least for the time being. If he chooses to muddle through, developments in the next several months will resemble the months that followed the Singapore Summit, except that the tables are turned in favor of the US this time. Kim Jong Un must know that this is only a temporary fix. Given that the North Korean economy has been stuck in negative growth for three years running according to the Bank of Korea, and given that last year, 88% of North Korea’s exports to China—which account for over 80% of North Korea’s export earnings—went up in sanctions smoke, Kim Jong Un has only so much time. Needless to say, the right kind of sanctions bite. Going beyond areas directly related to North Korea’s WMD activities, UN Security Council sanctions adopted since 2016 have had a punishing effect on North Korea, which is likely why Kim, at the Hanoi Summit, pushed for their removal. As long as these sanctions remain in place, there is no way the North Korean economy will achieve the progress that Kim Jong Un has promised to his people. As Hugh Griffiths, head of the United Nations Panel of Experts monitoring UN sanctions on North Korea, recently said, sanctions are “clearly the number one problem for Chairman Kim in terms of long-term sustainability…because you can’t spend decades engaging in clandestine and illegal ship-to-ship transfers of coal, or petroleum products.” The US government has also made it abundantly clear that sanctions cheating won’t be condoned even if the perpetrator were one of Japan’s top banks. Furthermore, the United Nations recently announced that, “A prolonged heat wave, along with typhoon and floods, has taken a toll on food harvest, which posted a nine percent drop from 2017 to the lowest level in more than a decade.” UN aid agencies sometimes exaggerate food shortfalls; nonetheless, it seems clear that North Korea is headed for a rough patch in feeding its population. Everyone hopes that Kim Jong Un will choose complete, irreversible and verifiable denuclearization, but this scenario is implausible. Kim Jong Un has invested too many resources on building a nuclear weapons program, and his reputation is at stake. He must worry about North Koreans living in poverty, but also about too much affluence. He wants economic development but also needs to control the process to maintain regime stability. This appears to be something that Trump the businessman struggles to fully comprehend. In addition, nuclear weapons can come in handy when he needs to discourage outside intervention, especially in times of internal troubles. Although one should never lose hope, genuine denuclearization by North Korea, certainly on the timeline the Trump administration appears to have in mind, is highly unlikely unless Kim Jong Un makes a decision to build a nuclear-free future for North Korea. Given the extensive nature of the facilities and infrastructure of the North’s nuclear program that would need to be dismantled, implementation of any denuclearization agreement will be a long and phased process and quid pro quos must be provided to North Korea along the way. But there has to be an agreement, at the outset, on a roadmap for this process. Otherwise, denuclearization negotiations may go on and on without the same understanding of a destination and a timeline. Kim Jong Un faces difficult choices. His attempt to sell Yongbyon for the third time failed. Sanctions are emptying his coffers. Holding on to nuclear weapons can be more risky than he had first thought. Kim Jong Un cannot hope to rule for the next few decades, let alone pass the throne to a fourth generation, unless there is a serious economic turnaround. He reportedly said to Pompeo in April last year, “…I have children. And I don’t want my children to carry the nuclear weapon on their back their whole life.” I hope Kim Jong Un will reflect on his words. From Seoul’s perspective, the recent episode in North Korea’s long nuclear saga is particularly disturbing for several reasons. First, North Korea’s nuclear threat has already become a clear and present danger as far as South Korea and Japan are concerned. That is why it is difficult not to have concerns over possible “small deals” that only address US interests: the absence of nuclear and long-range missile tests does not mean as much to South Korea and Japan as it does to the US. Second, we have a very unique US president who has little regard for alliances. The ROK-US alliance stood the test of time as it is rooted in shared values and interests. Right now, however, the alliance needs all the support it can get. Expressions of support from the US Congress and friends of South Korea are important. Third, the combination of a liberal president in Seoul and an “America First” president in Washington is, in itself, a challenge. When the US and North Korea are engaged in important negotiations without the presence of the Republic of Korea, it is crucial that the alliance be managed by truly capable professional hands on both sides. President Trump’s unilateral announcement in Singapore of the suspension of US-ROK combined military exercises caused great distress among many former officials and academics in Seoul. Equally, President Trump’s transactional approach to the alliance raises questions about the continued presence of US forces in Korea, especially if peace negotiations actually get underway. Fourth, ROK-Japan relations are in dismal shape, and there is no easy solution on the horizon. This is an additional burden on the ROK-US alliance as ROK-US-Japan security cooperation, which is necessary to cope with North Korea’s growing nuclear and missile threat, can be negatively affected by overall relations between Seoul and Tokyo. Finally, if US-North Korea negotiations take a turn for the worse, one must question how long the façade of coordination between the Trump administration and Moon government will hold up. One reason the ROK-US relationship has not shown more strains is the Moon government’s realization that Trump is probably the only US president willing to sit down with North Korea’s leader. If the current stalemate continues, anti-American sentiments may rise especially among the ranks of Moon supporters. If that happens, the ROK-US alliance will face even more difficult tests. Let us hope that commitment, trust and strategic thinking prevail on both sides and help the alliance withstand yet another test and come out even stronger. If nothing else, the Hanoi Summit was a rude awakening to Kim Jong Un and his appeasers. But the “no deal” meeting, paradoxically, could turn out to be a blessing in disguise and the beginning of genuine denuclearization if the US and North Korea can start negotiations on a concrete roadmap for denuclearization.